Cash-strapped municipalities, like Msunduzi, will now be able to save millions of rands previously spent on hiring plant equipment such as graders, honeysuckers and water tankers. 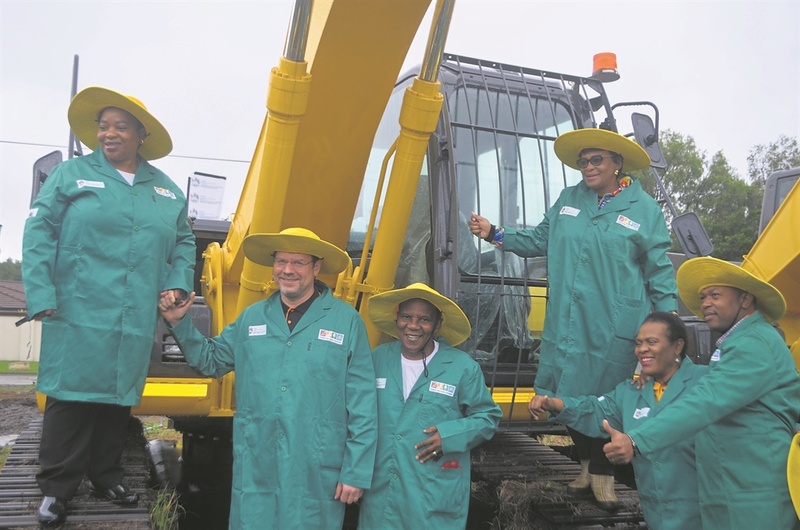 This after the KwaZulu-Natal provincial government invested more than R100 million on yellow plant equipment that municipalities can borrow free of charge. The equipment was unveiled by MEC for Co-operative Governance and Traditional Affairs (Cogta) Nomusa Dube-Ncube during the provincial launch of the Good Green Deeds campaign in the Pietermaritzburg on Friday. The programme is in response to President Cyril Ramaphosa’s call on all South Africans to take charge and clean up their living environments. Dube-Ncube was joined by national Cogta Minister Dr Zweli Mkhize along with his deputy Andries Nel and Environmental Affairs Minister Nomvula Mokonyane and her deputy Barbara Thomson, as well as KZN MEC for Health Dr Sibongiseni Dhlomo and MEC for Social Development Weziwe Thusi. They all joined Msunduzi councillors and volunteers as they cleaned up the CBD. “Today’s massive clean-up campaign — which will be rolled out to the rest of KZN — has been designed to clean up sidewalks and storm drainage and cut grass and verges,” said Dube-Ncube. She said the newly purchased equipment would help in cleaning drains, rebuilding infrastructure, filling potholes and improving the general environment in KZN’s municipalities — many of which have struggled with general cleanliness. “We also have water tankers because we are tired of seeing the millions of rands being spent on hiring them. Dube-Ncube said Mooi Mpofana was one of the municipalities that spent a lot of money on plant hire, saying it used to be about R1 million a month until Cogta intervened. She said the equipment would also assist Cogta as her team felt “helpless” when they wanted to respond to service delivery complaints from residents. She said now they would be able to go in and deal with whatever problems were reported instead of waiting for municipalities to do something. Dube-Ncube said the clean-up operations would be taken to other municipalities around the province. She said the government would also take steps to ensure that citizens were informed when their grass would be cut, refuse collected and environment cleaned. The aim of the campaign is also to reclaim public spaces such as parks that have turned into illegal dumping grounds. “We are pleased to report that many businesses are already showing enthusiasm and promising to avail their staff, adopt a spot to clean regularly and donate equipment for this province-wide clean-up campaign,” said Dube-Ncube. Her department also wants to revive the Food For Waste programme where people would clean parts of their city in exchange for food. She said it was stopped after government was advised that, legally when someone works they must be paid in cash. She said they have tried to engage with the Department of Labour, saying that initiative benefited families instead of just individuals. Mokonyane said they chose to launch the campaign in Msunduzi because it was identified as one of the municipalities that had challenges in waste management and enforcing environmental health by-laws. She urged Pietermaritzburg communities to look into business opportunities in the waste industry. She said this would help decrease the amount of waste that ended up at the landfill sites. “It’s all good and well that government is here to help clean up today, but this city will not be spotless if its residents don’t change their mindset about cleanliness. Stop illegal dumping, don’t litter and take pride in the area you live in,” said Mokonyane.